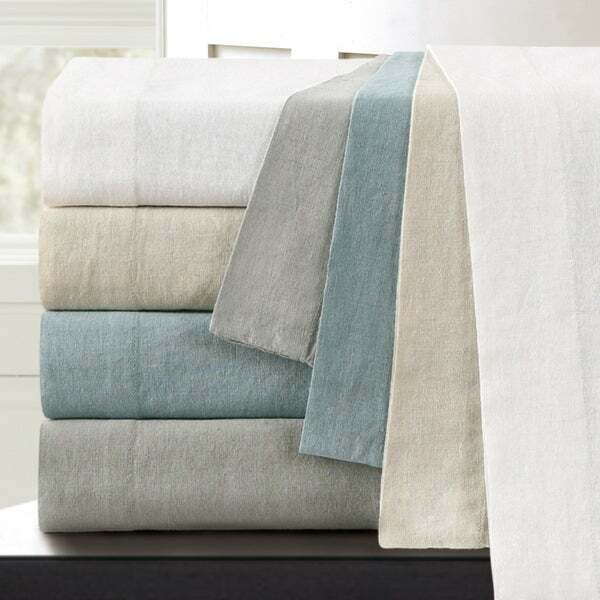 Echelon Home's washed linen cotton duvet cover sets combine the two most comfortable natural fibers. This blend marries the distinctive texture and durability of linen with the softness of cotton to create comfortable, chic bedding at a fraction of the price of 100-percent linen. They are pre-washed for added softness and casual appeal. This review compares the Amrapur Linen-Cotton blend (white) to the Echelon Linen Cotton blend (white) set. I ordered both looking for a decent quality, white, linen, duvet set. Both were good quality, but I returned the Amrapur set in favor of this one. The Anrapur seemed slightly less soft, and had a key difference in their construction. The Amrapur has a cotton side to the duvet cover (and shams) and this washed linen set is the linen/cotton blend on both sides of the set. The Amrapur set came in a nice linen storage bag with coconut shell buttons, but both sets just had regular clear plastic buttons on the closure. The Amrapur set is also just ever so SLIGHTLY more off white. Was very happy with this purchase. It washed up beautifully and is soft and has a great weight on the bed. It does seem a bit wide for our Ikea thin comforter but looks good. Hope this is helpful! I purchased this set several months ago and there are good and not so good things about it. This linen is not a super high quality heavyweight linen, you'll pay three times the price for something very heavy weight. This is a lighter weight linen but it looks and moves like linen if you're looking for a linen set, this is certainly one. The downside is however, mine has not withstood washing as well as I had hoped. The third time I washed it a hole about the size of a pencil eraser appeared on the front of the duvet cover. I immediately bought an iron-on patch kit and sealed it up and now always make sure the cover is placed "hole side down" when I'm making my bed. The patch has held and no further holes have appeared but I would have hoped it would have lasted much longer without a flaw like a hole would appear. I purchased the washed linen cotton blend duvet set in white and was pleasantly surprised by the quality given the price. It arrived well packaged and, once washed, was softer and a bit heavier than the original condition. I'm using the duvet cover on my bed without a duvet and it is perfectly fine as a late summer coverlet keeping me very comfortable during the night. The shams allow the piping on the pillows to show through slightly and the envelope enclosure could be longer to keep the pillow in better, but it's not a deal-breaker given the price. Overall, I'm very happy with the purchase. Great duvet cover for the cost. I wish it had inside ties to hold the insert in place. It also looks more cotton than linen. Overall, I liked it and feel like it was worth the purchase. I got this King duvet set in blue. I like that it’s a generous size, allowing for a nice drape on all three sides. The fabric is a cotton linen blend so not as soft as linen, but it feels like it will hold up over time and not wear thin. The pillows have a flap over the end so you don’t see the pillow inside. Overall I’m really pleased with this set. I compared several linen duvets before purchasing this one. It certainly is a value for the money. I filled it with two down comforters and it is gorgeous on my white iron bed. Several reviewers cautioned that there were no ties in the corners to hold the comforter in place. This didn’t bother me as I can easily sew shoelaces inside. Five minute job. So I was pleased to find ties already inside. They are small but they do the trick. I do not know if this is a new feature, or if other people just didn’t find theirs. I ironed the duvet and shams before making the guest bed. I asked my guests to remove it from the bed as two comforters are surely too hot. But they slept under it and reported it “heavenly.”the duvet did not get wrinkled at all. Thank you for offering a quality product at a reasonable price. This washed linen cotton blended duvet cover is really elegant. Great quality, and he to all colors. I would definitely purchase again for another model home. nice quality duvet cover - good texture in natural color. As described but it was very simple. It was the exact same color, cream, as my tufted headbord. Therefore, I would be returning it. Good quality sheets. Linen wrinkles easily even if take out of the dryer quickly, but overall would purchase again. Loved this set so much I purchased the matching sheets AND got them in two different colors. Note that the linen means you’ll have to iron or live with a slightly undone look. I love the look of this duvet. It’s a bit thin but looks to be pretty good quality. it does stain very easily and it’s difficult to remove stains. For the price I probably would not purchase again but I’m happy I did. There seems to be good quality and comfortable as well. It washes nicely. The shams are a little big and baggy for my taste but I just use something else. The fabric is a little thin but serves my purpose in our camphouse. This duvet was a little bit scratchy pre washing but now its softened and its lovely. Very comfortable and the perfect airy shabby chic look. "Will the king duvet be available in the stone color any time soon?" "The slate blue looks greenish in the photo...is it a true blue or a green-blue?" Not a green tone, definitely a slate cool blue. "To secure the down comforter within the duvet and keep it from shifting, most manufacturers place ties on the inside in each corner. Does this duvet have this feature?" Hello, This duvet cover does not have corner ties. Thank you! No. It doesn't have corner ties inside. I was worried about that to, but this Duvet doesn't seem to need it if you get the same size comforter and this thing is heavy, strong, durable...it will outlast me. For some reason it's easy to slide in and out but it doesn't move around? That hasn't been an issue at all for me. If you felt this material you would understand the durability of it is holding your blankets in place. My issue I was dealing with was my black cat. The cat hair gets imbedded within these fibers because they are individually so thick instead of being thin and silky, so I ended up folding a sheet and laying it on the spot he lays in, he's old, he won't change and the duvet is very warm. Like I said, it's heavy but if you put a light blanket in it there won't be so much weight to it. I live in Las Vegas and it's July with temps over 100' degrees but the duvet is cool so far this Summer and it was warm in the Winter. I really have no complaints. "When will the duvet covers be available in White?" Hello, They should be available in early July. Thank you! "Same question: are "taupe" and "stone" the same, and are they in fact the light beige/tan color?" It is definitely taupe and darker brown than picture indicates. "Is the color mislabeled for the duvet? On the photo it shows "stone" but the color choices list "taupe" instead." I wanted linen and I like the price. I keep this duvet folded at the foot of the bed on top of my ivory quilt. It’s a simple, elegant look that lets the other pieces in the room make the statements.